The life settlement marketplace is regulated state-by-state. Where life settlements are regulated, currently 43 states and Puerto Rico, the state insurance department oversees the licensing and conduct of companies in the business. Mason Finance is pursuing licensing in all jurisdictions where required. The map below outlines where Mason Finance is currently accepting new cases for review. 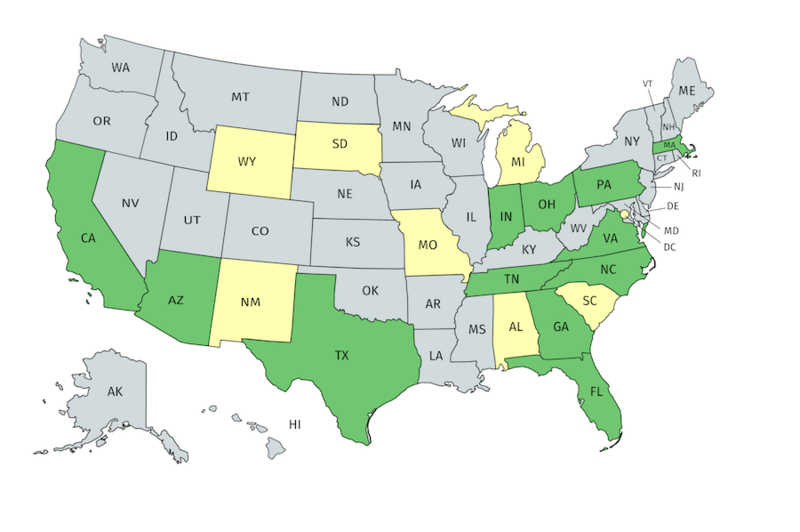 Mason Finance is licensed or registered to purchase policies in 12 states –Arizona, California, Florida, Georgia, Indiana, Massachusetts, North Carolina, Ohio, Pennsylvania, Tennessee, Texas and Virginia. Mason Finance also purchases policies in an additional eight states and jurisdictions where no license is required – Alabama, Michigan, Missouri, New Mexico, South Carolina, South Dakota, Wyoming, and District of Columbia. If Mason Finance is not licensed in your state, we can put you in touch with a company that is.